The SA account is a built-in administrator login on SQL Server, which has full control over any aspect of SQL Server. It exists in every SQL Server installation no matter which authentication mode you install. Most of the SQL Developers/DBA would have come across a situation that they forgot or lost SA password and have no other way but to reinstall SQL Server database. With SQL Server Password Changer you can easily reset lost or forgotten SA password on SQL Server 2000/2005/2008/2012/2014, and unlock the SA account in case it is locked out or disabled. Get instant control over locked databases no matter how many instances of Microsoft SQL Server are running. Click here to download the setup package of SQL Server Password Changer and save it in a place that is easy to find, such as your PC desktop. Launch the SQL Server Password Changer program. Click the Open File button. 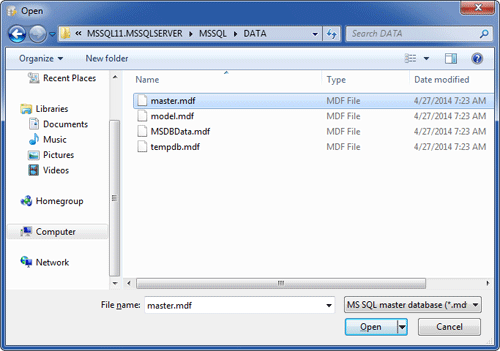 Select the SQL Server master database file (master.mdf). Typically it is located in the folder: C:\Program Files\Microsoft SQL Server\MSSQL.1\MSSQL\Data. The program will automatically decrypt the master database file and display all user accounts in your SQL Server. Select the SA account, click the Change Password button. Type a new password and click OK. The program will replace the existing password with your new password, and also unlock your SA account if it's already locked out or disabled.